Japanese healthy and economic Bento culture has become popular in oversea. Various Bento Box has been sold and some people started to make Character Bento (Bento with cute character motif) but “Magewappa” which is Japanese traditional art-craft is also gaining attention. 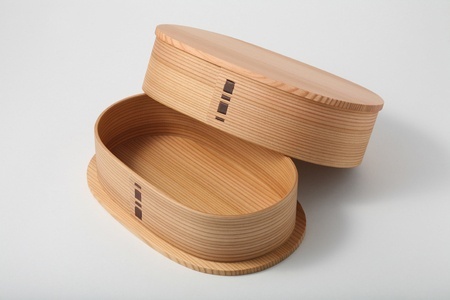 “Magewappa” which has been gaining attention with current Bento boom is a container made with straight grain Cedar/Cypress bent into circle form. Though Bento Box is the most famous, there are Ohitsu and dishes too. In Japan, container of thinly shaved wood bent into circle form is called Magemono and has been used in daily life since ancient times. Though there are a number of local areas who produce Magemono as art-craft or local specialties, “Odate Magewappa” of Odate, Akita is the only one who have been designated to Japanese traditional art-craft. It is said that the production of Magewappa in Odate has become popular in about 400 years ago during Edo period. The house of Satake who reigned Odate at that time was suffering from cold water damage. They focused on Natural Akita Ceder which was abundant in their land and promoted the production of Magemono using it. This is said to be the origin of Odate Magewappa. Traditional Technique has been handed over from Edo period to today by the hand of craftsmen. Odate Magewappa is referred to in the lyrics of Akita Ondo as a local specialty and has been popular as local specialty. It was designated as Japanese traditional art-craft in 1980 and became popular but after that, with emergence of plastic product, it had suffered for some time. However, these days, its value has been re-evaluated and it’s gaining attention from both in and out of Japan as not only traditional Bento Box and Ohitsu but also dish and decoration. It’s lumbered from cut out log. Natural Akita Ceder used as material is only those more than 200 years of age. From this Natural Akita Ceder, only part where doesn’t have knot and with beautiful straight grain will be used. Straight grain that appears when cut into the center of the log is almost aligned and even and is resistant to warping and crack. However, only small quantity can be cut out from aged log of large diameter. After it’s shaved thinly according to the size of the product, it will be put in water for a night and then softened with hot water. This will make it difficult to crack. It will be put around the tool called Goro of the size and form of the product and made into circle. Lapped part will be jointed temporally and dried naturally. After it’s dried, it will be jointed with glue and then saw with the leather of mountain cherry through holes. For finish, bottom or top board will be put in and glued. There are products that are processed with lacquer or urethane. The characteristics of Odate Magewappa is natural Akita Ceder as its raw material. Akita Ceder is one of the best woods in Japan and the natural wood grows much slower than artificial wood using thinning. It makes the wood stronger with thinner ring. The tree used for Magewappa is more than 200 years old and it has both beautiful grain and durability. The advantage of using Magewappa is the deliciousness of rice. Wood will absorb correct amount of humidity of rice and keeps rice delicious even after it’s cooled down. Also the antiseptic property of Ceder will protect food. The disadvantage is that it can’t contain liquid since its sealing performance is low and that it needs to have more maintenance than those in plastic since it’s sensible to humidity. Traditional Magewappa was for Bento Box and Ohitsu but currently there are a number of products adjusted to modern lifestyle. Coffee cup with beautiful grain has lightness of wood and also functionality of not passing heat. Sake bottle and cup which gives scent of natural Akita Ceder is the product to enjoy Japanese Sake. Also, Magewappa is adjusted into bread dish and butter case. Natural Akita Ceder grown in harsh winter of Akita won’t crack even in refrigerator and keeps butter in proper firmness. Magewappa is also used as interior such as lampshade with the warmth of wood. Modern design and traditional art-craft., together with allure of wood, Magewappa is broadening its possibility. In Japan, people are in fond of “petite luxury” which is to spend just a little more to enjoy something they like in daily life rather than to spend a lot for a big luxury. 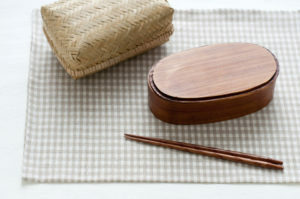 Bento of Magewappa is exactly the “petite luxury” that will make you relax during the work with the genuine art-craft.